The color blindness comes when we disregard other concepts as not worthy or instantly retreat into our likes and dislikes. In the name of discovery, it is best to 'turn down' that volume knob so it doesn't block other important observations. Even in teaching, it is good to observe how certain sounds are made looking at the physical, emotional and conceptual aspects of your student that would contribute to certain sounds. I am sure you all noticed that I came in early for the last part of the Tuba Mirum solo demonstration. I realized when listening to it that my mind got preoccupied with a new sense of that line in feeling, color and nuance. The mic that I am using is the one on the computer. Very limiting. So, because I think these videos are a way to get some of my ideas out there, I am going to get some better equipment, like a good mic! So then, you will be able to better sense the different tone colors that I am talking about and am demonstrating. Funny isn't it? Equipment is important but sound shouldn't start there. It needs to be discovered by hearing different trombonists and other instrumentalists. A very good friend of mine, a terrific tubist, educator and musician, Gary Ofenloch, used to kid me. Right before I would play a note, he would rattle off about 10 different qualities he would want in a sound, like: round, rich, clear, vibrant, ringing, full, deep, projected, big, sweet, centered. It is a fun and interesting thing to ask yourself - what kind of qualities do you want in your basic sound make-up? Some people like just nice, clear, fresh water. Others like a full bodied brew or stew filled with a certain balance of several ingredients. Try the syllable exercise that is suggested on the video. Do it on a note that feels comfortable for you and make each syllable very distinct and a bit exaggerated. Then do it more subtly. You can get to a point where just the slightest introduction of one syllable can change how you produce a sound. See what happens! More for week 4 of FBSMC 2! The first week of this year's Frequency Bone Summer Music Connection can be applied throughout all that we are doing in the other weeks. It is that basic formula of C + X =R. If you forgot or did not see it yet, go back to week one's supplement writing. It is a great formula to work into especially in times when you can't think of what to do or you are in a rut of some kind. You can try a three way formula with range too, such as: air speed + syllable + more/ less mouthpiece pressure. In your low range you might want to try different air speeds and/or temperatures with different syllables and experiment with mouthpiece pressures of various kinds. Sorry for the delay! My computer was having some problems. Range development is interesting and it comes very naturally for some people and for others it can be a real struggle and takes a long time. It is a matter of having the time and mostly having the exercises and approach that can make it happen as efficiently as possible. We need the 'muscle' to sometimes have the ability to form the technique we need. But the constant desire to have a fine range and doing basic exercises in a thoughtful way, can lead us to the discovery of what we need. In part 2 of this series I will get into very specific things that I currently practice and things that I have done in the past for developing my high range and low range. It will be closely related to the topic of week 2 "Embouchure and Air". I will post this in a couple of days. Stay tuned and keep up the thoughtful and feeling practicing! The value of repetition and the natural process of what it is is inherent in life at all levels. There is an upside and a downside to this as it pertains to our habit life and our development life. What we practice on a repetitive basis forms the foundation of our skills, attitudes and musical connections. It is how we use this natural repetition that can move us forward or keep us held back, as if stuck in mud or snow. It is finding the right actions for the circumstance, and this comes with your continued passion, interest and drive towards what we say we want. Even our wills get tested over and over again and just like the muscles that get stronger from lifting weights, for example, our wills get stronger from the many ups and downs we encounter. It should be clear that repetition in this context cannot be escaped from. It is a matter of continually finding new ways and sticking to the things that work from which we can build the ladder of our accomplishment or next level of attainment. Practice (repeated actions done regularly) can keep us ever renewed or continually trapped in old unwanted ways. There are academic rules, and there are natural laws. Which one should govern the other one, in your mind? Articulation or Air-ticulation? That is the question. And that is the DISCOVERY! From the very beginning, as brass players, we are taught some form of articulation. Whether it is to say "TAH", TOH" or "TUH" and then eventually for trombone players to say "DUH", "DAH" or even "LAH" for legato articulation. All of these suggest the placement of the tongue with a syllable as well. One famous bass trombonist from 'yesteryear' was a man named John Coffey. He used to say to his students, "Tongue and blow, kid!" In a sense, that can be the very basic mechanics at play without being very specific. When players just think of tongue, oftentimes this can lead to all sorts of tension in the throat and lay the ground for articulation problems such as stutter attacks, where a person has a real difficult time coming in on the first note of anything. So this is where air-ticulation is vital in the three fold mechanism of articulation, air-tongue-embouchure. Remembering to use our air can make things less tense with more fluidity and ease of production. The serious player will discover eventually what articulation match feels comfortable for them. But one thing I have noticed as a trend is playing really short is out of fashion. Not only short, but having a variety of articulation seems to be 'dated.' Long rounded articulation seems to be what is 'in' now and I see some of the reasons for this. In some of the cases regarding the enlargement of tone size, the longer articulation seemed to match it better or was found easier to produce in conjunction with a larger sound. Plus conductors also seemed to warm to a 'rounder' sound from the brass and naturally this meant not such a pointed front to the articulation. Let's face it, in terms of having greater accuracy, lots of variation in tone color, dynamics and articulations gets more difficult. It is easier to 'control' just a couple of things rather than a larger number of possibilities. However, I have found that different kinds of articulation build greater control and work on specific areas of the embouchure and air support systems. Take some of those basic Arban and Kopprasch etudes and use different articulations. Play them really short and dry, soft, short and accented, long with a small little space, accented long with no break and on and on. The various combinations are endless. In the end, I have found each kind of articulation has its merit physically, therapeutically and most importantly musically. Would a great painter only use one kind of brush stroke for everything? Perhaps in your practicing this week some of you are asking, "Can loud playing build embouchure and air efficiency?" I would have to answer yes to that. Loud playing can build muscle strength and grip in the embouchure. But too much of it can cause the tone to lose certain properties like high overtone ring, sweetness and responsiveness. If loud playing can be integrated in a balanced way into a person's practice diet, it can be very helpful in building endurance, size and depth of tone and projection to name a few things. Plus we learn something about our lung capacity and the limitations of our range in this louder dynamic. It might stretch us into finding other ways of manipulating our embouchure. This is fine as long as we don't lose the basic overall structural integrity of the embouchure. Adding more powerful volume levels is good. It can be great to practice them outside if we can. This is where the importance of concept comes in because our bodies, no matter how strong we can get them, have limited fuel and energy levels. But, the power of the mind, once realized, can have unlimited resources and be a very important facilitator in our quest for more power, and more importantly timbre and sonic expansion which is hopefully musically connected at its base. Certain kinds of practicing are like strong potent vitamins. A little at a time, with care, is the way to go. Listen to what your body is telling you ! When in doubt, STOP. Then start again refreshed ! 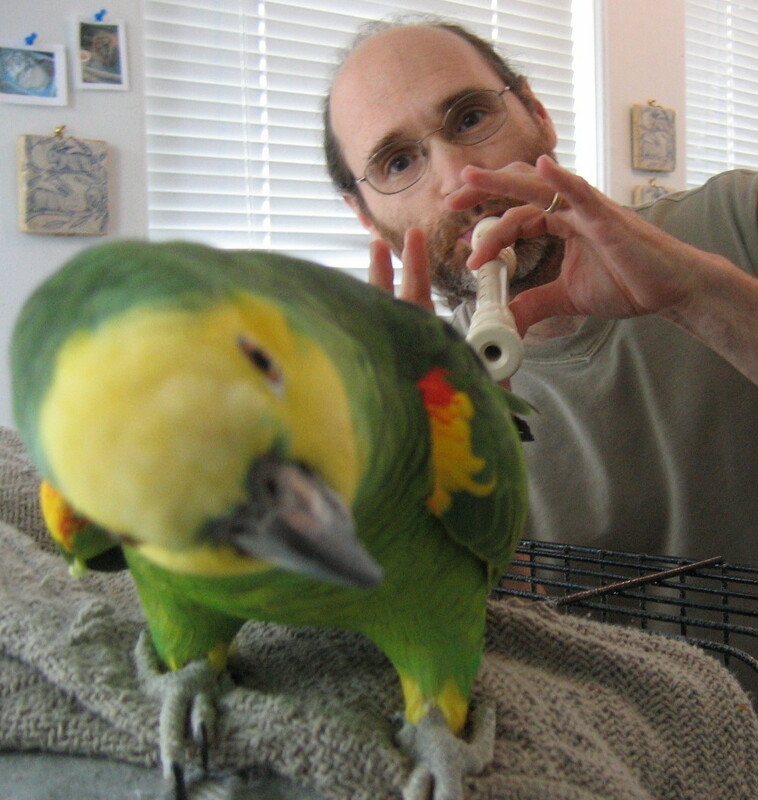 Embouchure and Air, is it a good marriage? Many times our concepts help shape our playing apparatus. In this case, I of course mean the structure and mechanism of the embouchure and the way we operate our inhales and exhales. I have seen people who have a concept that does not match their physiology. This creates great conflict and an unnatural feeling in the person. Some body types and character types do not fully support certain sound concepts. A huge deep wide sound might be what some player wants but it might not be 'them' at the level of their physical framework. Getting bigger equipment might not help either but could actually make it worse! At other times the reason why a player may change equipment could be very useful. In the end, sound production needs to have a natural ease about it and, if it does, that would be a sign of a certain coordination between concept and physiology (and equipment). If a person has a very tight concentrated mouthpiece sound, that can potentially have the making of a very full resonant quality, if they have a good amount of air to pass through that set up. If not, the quality of the sound might be leaner and not resonate too much of the lower overtone spectrum. As I have said at other times, air speed and temperature come into this. A slower warmer air speed can help the person with a very tight mouthpiece sound to fill out and open up the vibration. The reverse is true of the person with a wide more porous mouthpiece sound where a cooler faster air speed can bring more high overtones into the sound with, of course, a combination of other kinds of exercises. Different syllables also can aid or detract from this process. The syllable OH, is not always useful in making a sound have more size or openness. Depending on the factors of lip vibration quality and air pressure-speed and temperature, OH might be the most inefficient syllable to work with (especially in cases where the sound suffers from lack of center and ring). I said in the video that efficiency can help broaden one's scope of color, nuance and inflection by the fact a person would have more control to do what they would want. This came up in relation to building more efficiency by practicing softly in a variety of ways. To make this clearer, let's use the example of an oboe player. An oboe does not have the decibel scope of a brass instrument. So, the oboist needs to make a lot out of a little! Each variation needs to be very vivid. This is done not just by decibel contrast but by nuance and inflections that are hopefully originating from a connected musical intent. If you have a clear and steady bowl of water, it does not take much movement to cause a ripple does it? If our sound can have that same kind of focus and fluidity, then we have the option of saying a lot without the need of a great wide decibel level. This puts us in a position to create more using less. Sounds very efficient! Keeping the embouchure intact with good form in the corners and upper and lower lip contact can keep us playing at a good level for many years, for even when we age and find that our air capacity might decrease, we can know that we have an embouchure (in conjunction with musical feelings and nuances) to keep making music full of contrasts and expression. I hope for those of you who are trying this three-step method that it is showing itself to be useful. If any questions about it come up, or you would like to share your discoveries using this exercise, I encourage you to write it in the comments. Also, as I'm sure many of you have discovered, you can use anything as a constant plus anything else. So the formula is C (constant) + X (anything else) = R (result). For example, let's say you are working on articulation clarity, you could do articulation plus rhythm or articulation plus tone or articulation plus pitch. In this way, you can use this tool as a diagnostic for your articulation or anything else. It really goes everywhere. These methods are designed to offer different perspectives and angles on any given facet of playing. Don't be rushed into trying a million combinations. It is just a suggestion. The formula is what it is and there are an infinite number things you can plug into it. Especially useful if you are in a rut with any given aspect.